Made of Durethene® high density polyethylene. Colours available are in international orange and international yellow. Safety fence is produced in standard rolls of 15.24m, (50') and in heights of 1.22m, 1.52m, and 1.83m, (4', 5' , 6'), custom lengths are available on request. Used to warm pedestrians of dangerous area, reduce wind swept debris at excavation, construction, and demolition sites, restrict access to off-limit areas, provides effective crowd control at sporting events, parades, and any event which attracts large numbers of people, mark courses at skiing completions and bicycle, cross country or motor cross races, delineate safe walkways, and mark the boundaries of athletic fields and play grounds. Durethene® polyethylene safety fence is easy to install and remove because it is lightweight and easy to handle. There is also no need for gloves, Durethene® fencing doesn't cut or scratch as metal fencing does. It can be installed and removed by just one person and when it has to be removed, it can simply be taken down, rolled up, and stored until reuse. Durethene® polyethylene fence is tough and flexible and made to withstand the effects of time, weather, and temperature extremes. It is much more versatile and offers many more advantages than metal fencing. Durethene fencing is rust proof, acid resistant, non-toxic, non-conductive, and maintenance-free because it never needs painting. It will not rot and is unaffected by temperatures from -60F to 200F. It is stored easily. Bright, non-fade colors and rugged engineering provide excellent visibility and safety in a variety of construction, industrial, and sporting applications. 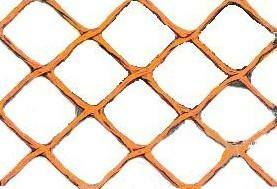 Safety fence is built to withstand rough handling and storage, and it washes clean for repeated use. Use safety fence whenever you need a strong, highly visible barrier that can be put up and taken down quickly and easily.